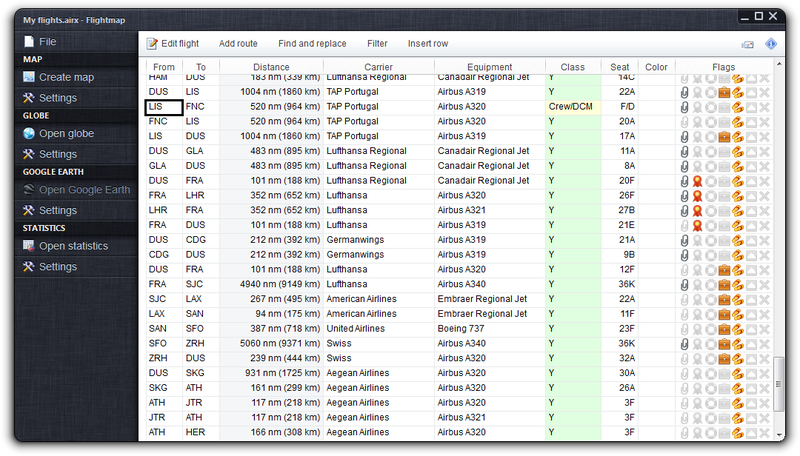 The main window displays all flights of an itinerary in a spreadsheet-like table, having one row for each flight. 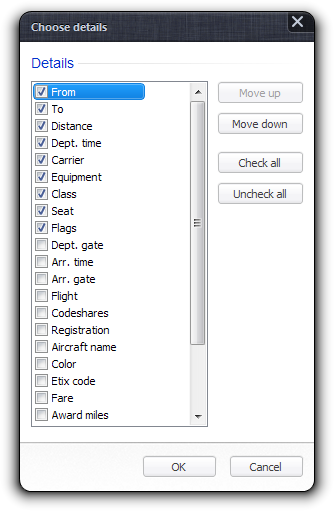 Flightmap can store many properties for each flight, but only a few of these are visible by default. You can right-click the header and use the “Choose details” command to add and remove columns (you cannot remove the “From” and “To” columns, though). Your preferences are stored in the Windows registry on a per-user basis (i.e. they are independent of the itinerary file). You can always access all information regardless of the columns displayed using the “Edit flight” dialog (see below). The currently selected table cell has got a thick black border. You can navigate through the table with the usual positioning keys. With a few exceptions, you can change the cell contents by starting to type. Please note that certain columns accept only certain characters (e.g. the “Seats” column only allows numbers and capital letters), and that some columns like “Distance”, “Flags” and “Rating” have got special properties (see below). You can add a new flight to the itinerary by editing the last (always empty) row. After you have finished editing, the row will be added as a new flight, and the empty row moves down. A flight's distance is calculated automatically using the “From” and “To” IATA airport codes, and cannot be set manually. Distance calculation works only if both codes are in Flightmap's database; unknown or invalid codes will be displayed in bright red. You can use the “Edit flight” dialog to set waypoints for roundtrip flights. An example is the annual Air Berlin polar flight, which both departs and arrives the same airport like DUS or TXL. If both airports are identical, the dialog lets you set the GPS coordinates of a waypoint—the distance is then calculated at double the distance between the airport and the waypoint assuming a Great Circle route. The paperclip indicates flights with files attached to it. Clicking this icon opens the “Edit flight” dialog. Flights can be flagged as award flights of your frequent flyer program. If you also store trips other than by plane, you can tag them as ground transportation (e.g. cruise ship or bus). You can mark flights as both business and/or leisure related trips. You can flag a flight to indicate when you've reveived an upgrade . Cancelled flights may be stored in an itinerary for reference purposes, but will not be visualized or recognized in any other way. A cell of the “Rating” column accepts the keys + and -, and also the numbers 0 to 5. You can use the mouse to directly click on the stars, in half-star increments. Cancelled flights (see above) are displayed in light gray. Future flights (calculated by day, using the current system time) are printed in dark green. This gets updated automatically. 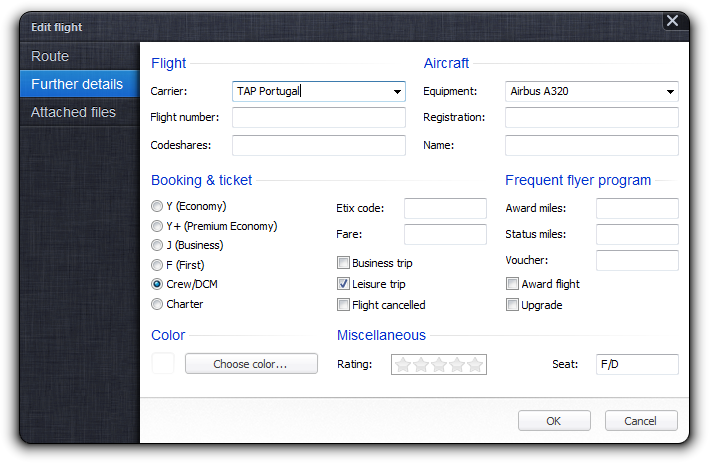 The “Edit flight” dialog offers access to all properties of the selected flight, regardless of visible table columns. The dialog is organized in three tabs: “Route”, “Further details” and “Attached files”. The “Route” tab contains all the basic parameters for a flight: the start and destination IATA airport codes, along with departure and arrival times and the respective gates. 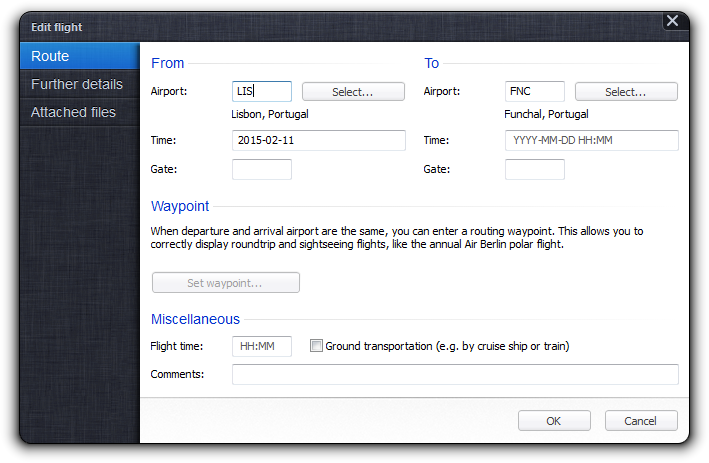 You can also manually log the flight time, and write comments on your flight. 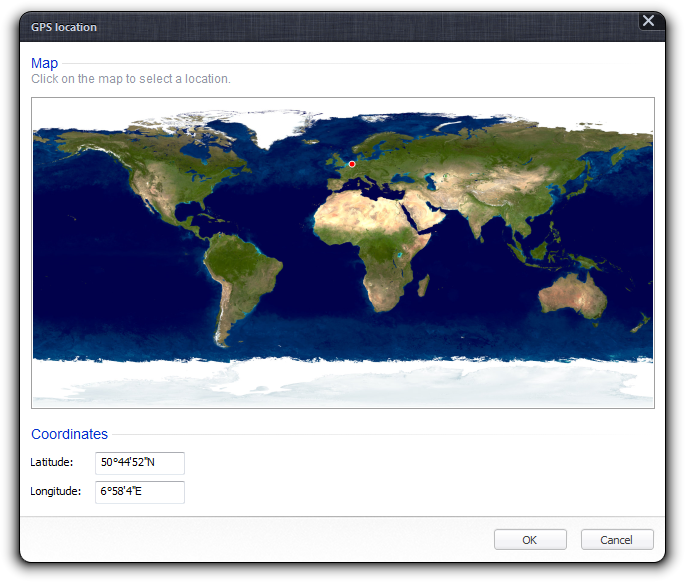 Flightmap also supports roundtrip flights, like the annual Air Berlin polar flight. If you set both “From” and “To” to the same airport code, the “Waypoint” button becomes enabled. It opens a dialog that lets you set the GPS coordinates of a waypoint—the distance of the flight is then calculated at double the distance between the airport and the waypoint assuming a Great Circle route. The middle tab allows you to enter further details regarding the flight, like utilized aircraft, booking and your frequent flyer account. 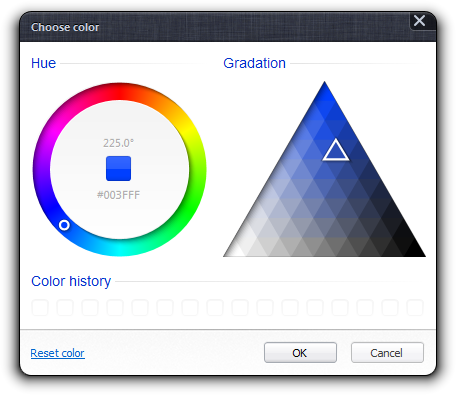 You can also choose a color for this particular flight, and rate it. The “Carrier” and “Equipment” combo boxes are initialized with airlines and aircraft types from both Flightmap's database and your itinerary. Flightmap enables you to attach up to 16 files with a size of up to 1 MB each to the selected flight. You can find more information on attaching files here. The “Add route” command enables you to add multiple flights which share some data simultaneously. If you return from a multi-leg route, you can use this feature to save some work. You can enter a complex route at once, e.g. DUS-FRA-JFK,EWR-MUC-DUS (flights use a hyphon between airports, ground transportation like from JFK to EWR is entered using a comma). You can enter additional information which will be copied to each new flight, like class of transportation or carrier. After the flights have been added, they can be edited individually. 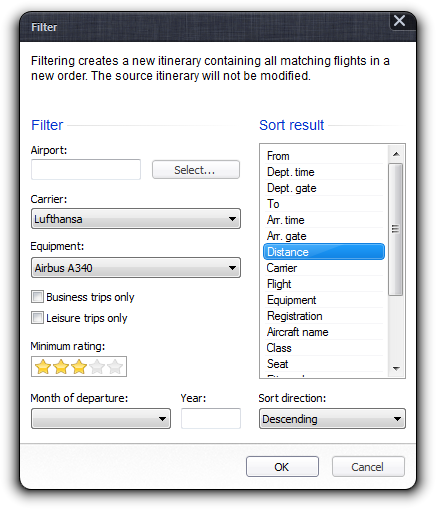 The Filter command opens a new dialog where you can enter various criteria for filtering your flights, e.g. “Airport”, “Carrier”, “Equipment” or “Rating”. After confirming the dialog, a whole new itinerary file will be generated based on your flights and the filter, and optionally be sorted by the column you've selected in the previous dialog. Your original data will not be modified in any way. 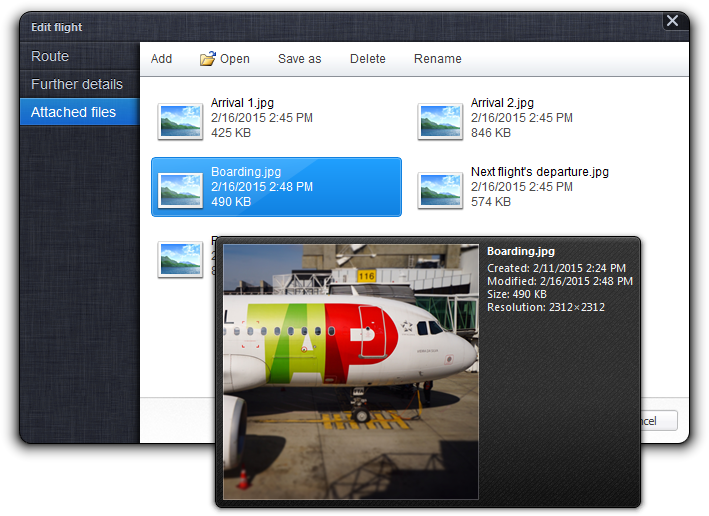 You can use the Windows clipboard to duplicate flights, or copy them between two different itineraries. If you navigate through the table while holding the Shift key, you can select a range of flights. 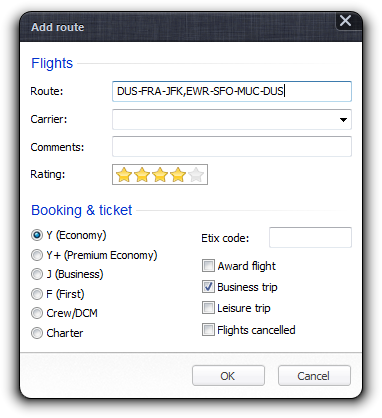 The “Select all” command from the context menu selects the entire itinerary. Subsequently, the commands “Copy”, “Cut” and “Delete” become enabled. 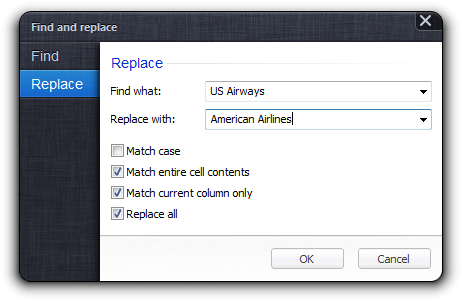 “Paste” is available whenever flights are stored in the Windows clipboard. Instead of using the table's context menu, you can quickly use the usual Windows keyboard commands.